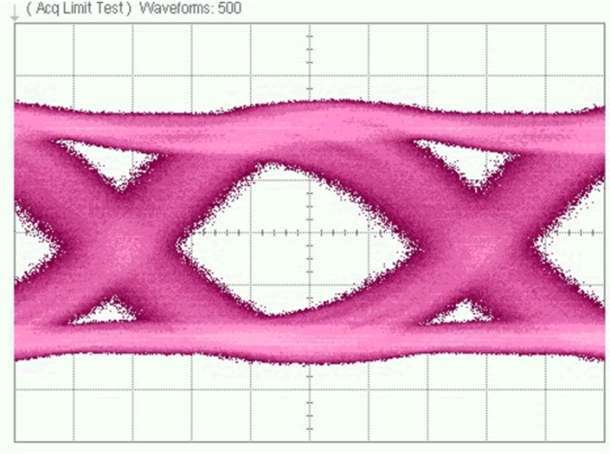 Kawasaki, Japan, November 9, 2011 — Fujitsu Laboratories Limited and Furukawa Electric Co., Ltd. have jointly developed optical interconnect technology for the high-speed, large-bandwidth internal data transmissions that will be needed for the next generation of high-performance servers. To develop the next generation of high-performance servers, several hurdles need to be overcome. Specifically, transmissions via the currently used copper wire present limitations with increasing speed and bandwidth. With optical transmission over fiber-optic lines, on the other hand, issues arise concerning required space. Now Fujitsu Laboratories and Furukawa Electric have developed optical interconnect technology that increases the density of fiber-optic lines while enabling high-bandwidth internal communications at speeds of 50 terabits per second (Tbps), ten times faster than is possible with today’s copper lines. This technology promises to enable high-bandwidth, high-performance servers capable of a wide range of services involving real-time analysis of huge amounts of data from sensors, such as forecasts of traffic congestion and of electric-power demand. Ongoing improvements to CPU performance have led to an astonishing increase in the data-processing capacity of servers. Furthermore, virtualization technology that consolidates multiple processes in a single CPU is advancing and the volume of data exchanged between CPUs and required memory capacity is rapidly increasing. Accordingly, several terabits per second of input/output signal-bandwidth capacity will become necessary. This creates a need for interconnects between multiple signal sources that can handle transmission speeds of tens of terabits per second in total. Conventional interconnects pass electrical signals over copper wires, making it difficult to generate transmission speeds of 10-25Gbps because simply increasing the number of copper lines leads to problems of waveform degradation and signal interference. Optical fiber, on the other hand, has excellent characteristics in terms of high speed, large bandwidth, and transmission distance, which have already led to its use for long-haul telecommunications and subscriber networks, and it has recently begun to be used in servers for data transmission. But the limited space inside servers has made it difficult to accommodate a large number of fiber-optic lines in this application. Fujitsu Laboratories and Furukawa Electric have built on technologies held by the two companies to develop high-bandwidth interconnect technology that can be used inside servers (Figure 1). 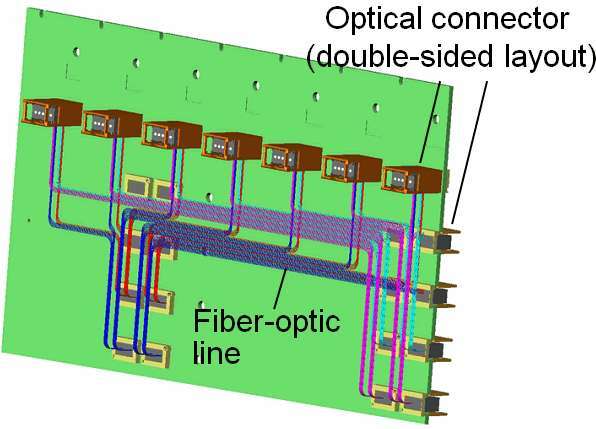 The use of thin, highly flexible optic fibers, along with high-density optical connectors made possible with multiple lanes, allows for line capacity to be increased from the existing figure of 500 lines to 2,000 lines. 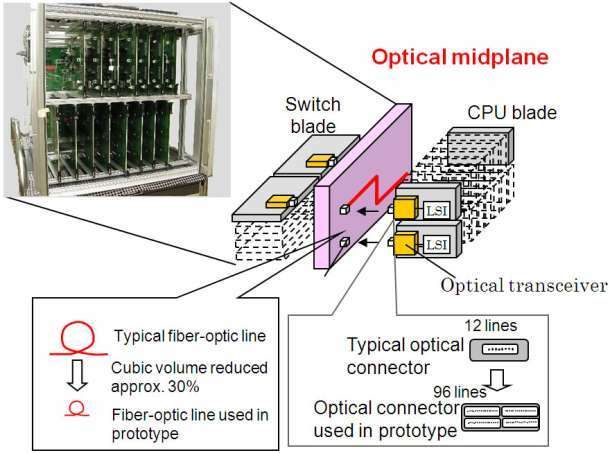 These technologies were used to build a prototype (Figure 2) optical midplane(1) with optical fiber lines packaged densely together. An evaluation of transmission characteristics was performed using this midplane, which showed that, with 2,000 lines, each capable of 25Gbps (Figure 3), together they could carry a total of 50Tbps. This technology can be used to compactly accommodate 2,000 optical lines for a tenfold increase in bandwidth, to 50Tbps. This enables high-speed signal connections that will be used in next-generation servers. The two companies are moving ahead in converting the core technologies that they have developed into actual products, and are also exploring a variety of applications, with the aim of commercializing these technologies within the next few years. In a device that uses multiple boards, this is a substrate used to create connections between boards.